Hello and Happy New Year! Even those of us who love to cook deserve a little time off to indulge in restaurant food, and that’s exactly what I’ve been doing for almost two weeks. I spent a week in northern California with my boyfriend devouring burritos, wine, and an unmentionable quantity of cheese. By day five of this so-called break I felt full of unhealthy and impure food and was ready to nosh on a huge homemade salad. 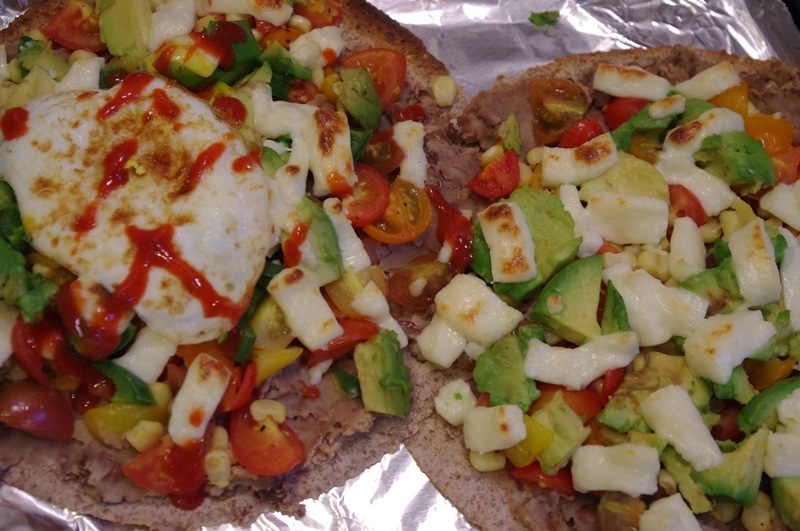 Back in NYC I was planning to meet up with an old friend for brunch but couldn’t bare to shell out another penny for greasy food – it was the perfect opportunity to get back to the kitchen and cook up something nourishing. With Mission Street in San Francisco still fresh in my mind I decided to make a dish with Mexican flavors. 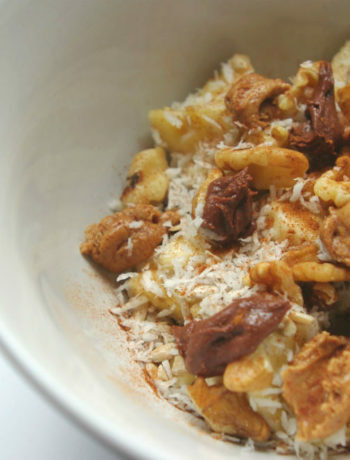 As with most of my cooking, I simply combined some of my favorite flavors and hoped for the best. 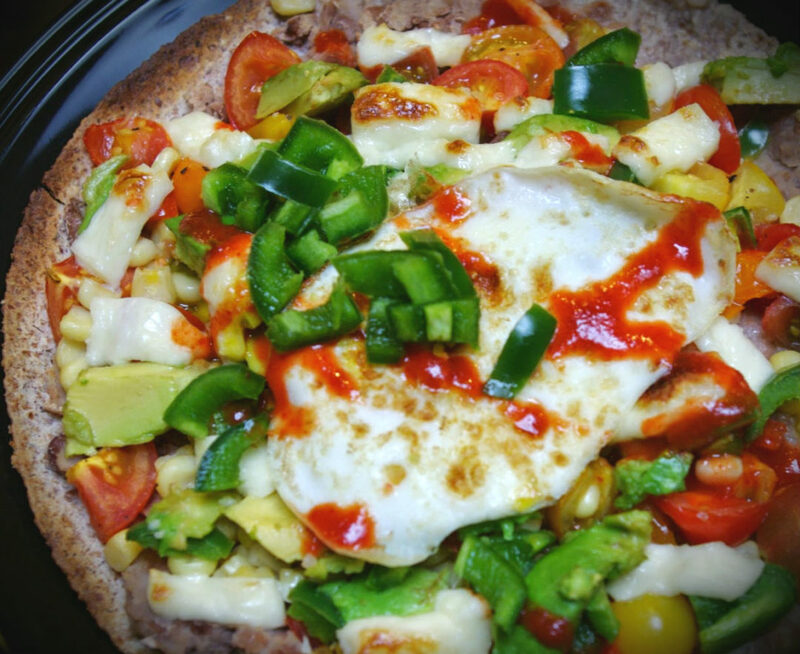 The Mexican pizza that resulted was truly delicious and, when topped with a fried egg, surpassed any of the $15 scrambles I could have gotten in my neighborhood. This took less than 20 minutes to make – enjoy! Pour the drained pinto beans and a teaspoon of olive oil into a pot over low heat. Using a potato masher or a spoon, mash the beans. Add 1/4 teaspoon of garlic powder, 1/4 teaspoon of cumin, and a pinch of salt. Stir and continue warming the mash for five minutes, then remove from heat. 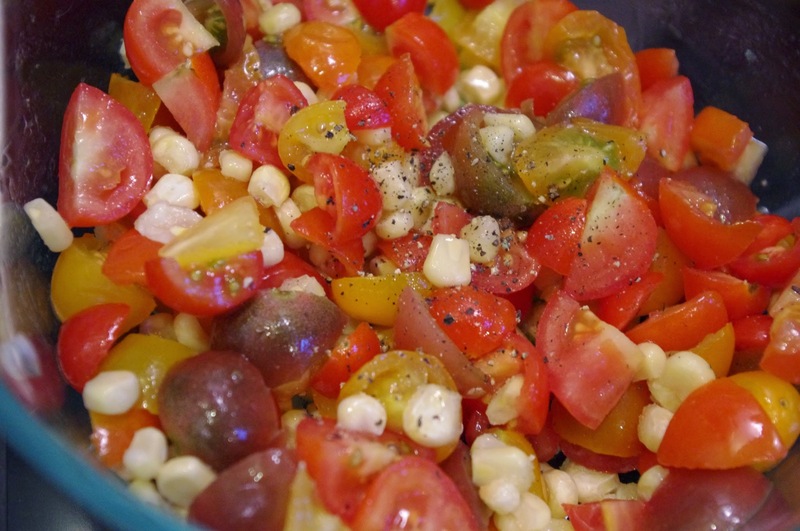 Place your sliced cherry tomatoes and corn into a small bowl and add in a teaspoon of olive oil, salt, and pepper. Stir thoroughly. Slice the avocado in half and remove the pit. Gently slice the avocado into thin strips or squares without removing the flesh from the skin. Line a baking sheet with foil and place the two tortillas separate and flat on the foil. Turn the oven broiler on. 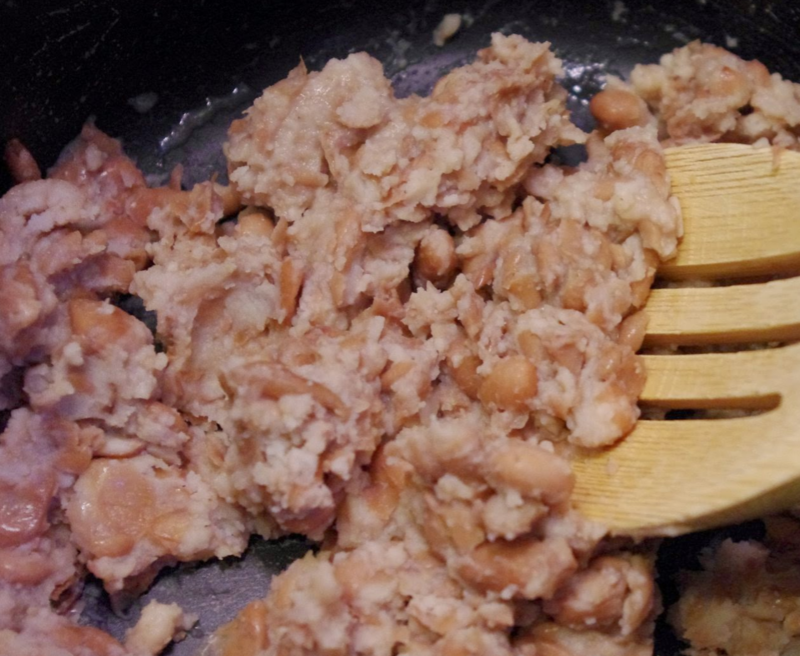 Using a spoon or spatula, spread the mashed pinto beans onto each tortilla evenly. Top with the tomato and corn mix and diced jalapenos (note: for added spice I reserved half of the jalapenos and sprinkled them on the finished product). 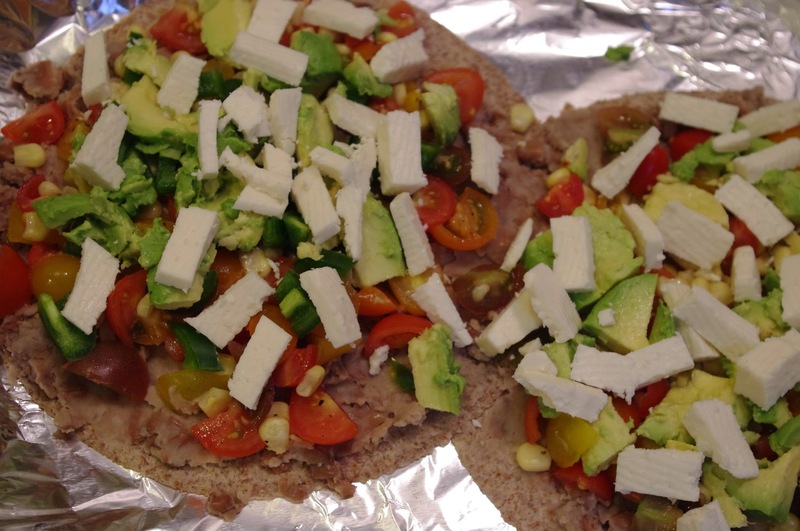 Use a spoon to scoop out the avocado strips onto each pizza. 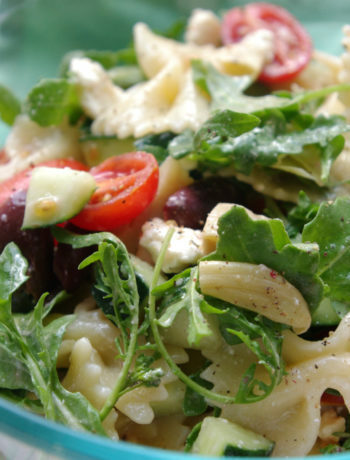 Top with pieces of queso fresco. Place the baking sheet in the oven and watch carefully for five to ten minutes. The broiler should brown the edges of the tortillas and the cheese. 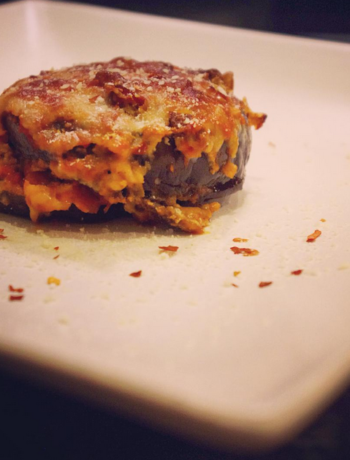 Remove from the oven and serve with salsa and, if you’d like, a fried egg, raw jalapeno, and Sriracha.